Need a new way to jump-start your day? Try this Banana-Kale Wake-up Smoothie from our brain health team. Making a smoothie vs. juicing saves valuable fiber and other nutrients that are discarded by juicing. Try this tasty version from Marwan Sabbagh, MD, Director of Cleveland Clinic Lou Ruvo Center for Brain Health. 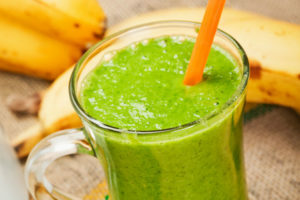 Put kale, bananas, yogurt, orange juice, honey and ice in a blender and puree until smooth. Pour into glasses and garnish with a tiny pinch of ground cloves. Serve right away.